June 7, 2017 — Context changes everything. Historical stories and parables come to life with just a bit of insight. 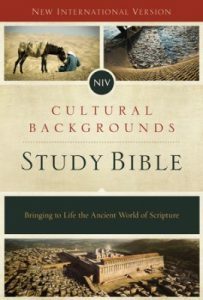 Zondervan, the creators of the NIV Cultural Backgrounds Study Bible: Bringing to Life the Ancient World of Scripture, developed a new scriptural experience for Bible readers everywhere with the idea that clarity could be given to even the most well-known Bible stories. Most recently, this Bible’s unique offerings have been noticed and praised by industry organizations like American Book Fest, which covers books from all sectors of the publishing industry—mainstream, independent, and self-published. On May 22, 2017, the NIV Cultural Backgrounds Study Bible was awarded the International Book Award and recognized as Award-Winner in the “Religion: Christianity” category. According to Americanbookfest.com, this year’s contest yielded over 1,500 entries from authors and publishers around the world, which were then narrowed down to the final results. In May, the NIV Cultural Backgrounds Study Bible was also the recipient of a 2017 Christian Book Award for Bible of the Year, from the Evangelical Christian Publishing Association (ECPA). This industry award is regarded as one of the highest honors given to Christian books and Bibles. As interest continues to swell around this highly-designed study Bible, Zondervan has announced it will be releasing the Cultural Backgrounds Study Bible in the NKJV translation in the August 2017. Both general editors, John H. Walton and Craig. S. Keener, are experts in the field of ancient cultural origin, which allows them to create rich and engaging commentary for Bible readers to dive deeper into their study of the days before, during, and after Christ. “Since the majority of Bible readers shop with translation as their first priority, it is imperative that we introduce long-time NKJV Bible readers to this insightful, engaging commentary. I trust NKJV readers will love and appreciate this study Bible every bit as much as NIV readers,” says Melinda Bouma, associate publisher, Zondervan Bibles.